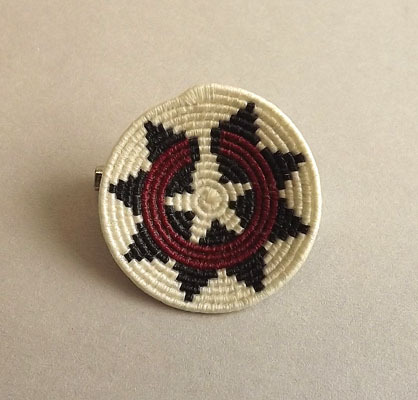 This intricate pin by Manalisa Camarena is a traditional Navajo ceremonial basket in white, black and red. A Navajo Ceremonial or Wedding Basket is a map to chart your life. The black represents struggle, the red is family, and the white represents enlightenment. The line leading from the center to the outer rim is there to remind you that there is always a path to the light. The final coil of the design should end above the path. Manalisa creates her amazingly detailed miniature baskets out of silk thread coiled around a base of florist wire and finishes them with fabric hardener to retain their shape. For more by this artist, click here.